Jesus is better than us at our careers. Jesus is better than us at doing our jobs we’ve received years of training for. Jesus knows more about what we do than we do. Here Jesus is not just telling but showing us how fish are caught. 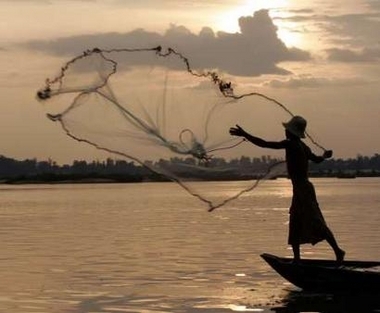 We know that when Jesus calls us as his disciples he promises to make us fishers of men. He makes us fishermen. It is a transformational work of God, not of ourselves (lest any of us should boast). In Luke, Jesus schools the professionals on how to do their own jobs. They had given it their best, professional shot. They toiled all night with nothing to show for it. In their eyes there was no way to have success and even briefly questioned Jesus concerning his command to drop the nets again. They questioned Jesus, who had more than a little to do with the laws of physics keeping the boat on top of the water, who created bodies of water complete ecological life and who also intricately, wonderfully “knitted” Peter together in his mother’s womb. You see, Christ is the one who shows us where and how to fish for men. He has authority. He is intimately aware of those around us daily and holds the key for us “fishing” effectively. He can do your job and lead your life better than you or I can. God sovereignly gives us opportunities in quickly-passing moments with strangers and life-long relationships with close friends to “catch” people with his gospel. This is deeply true of every waking moment of our lives as believers. The obedience of Simon Peter and the others brought about a huge catch that day. There were so many fish that they almost sank! Help was needed from another boat to wrangle all of the massive catch! This brought Peter to his knees, acknowledging his sin and need. When Jesus directs us and we obey, he takes care of the rest. And we are put in our place: at His feet. Prepare your heart for a catch. Expect God to work. Let Jesus lead and guide your heart this week wherever you find yourself. He knows where to let down the nets. There’s no need to fear. He is the Master Fisherman.